​The research project - as summarized in the figure to the right - will be conducted in two project phases, each containing tiered activities, and contingency plans, that are driven by a data evaluation pipeline and informed by GE³LS research. ​Below we elaborate on the project activities. Project Phase 1: Three species-specific EcoToxChips will be developed, tested, validated and commercialized for laboratory model species representing the most important vertebrate groups in ecological risk assessment (fish-fathead minnow; bird-Japanese quail; amphibian-Xenopus laevis). Model species (adult and early-life stage, ELS) will be exposed via standardized tests to eight environmental chemicals representative of natural resource/environment sectors of Canadian concern and also ones that impact a wide biological space (EE2, chlorpyrifos, benzo(a)pyrene, lead, fluoxetine, selenomethionine, trenbolone, HBCD) (Activity 1). An integrative systems approach based on functional ‘omics (combined global transcriptomic and proteomic profiling, targeted metabolome) and physiological analyses across levels of biological organization will then be applied to characterize relevant toxicity pathways including adverse outcome pathways, AOPs (Activity 2); from this, and other resources, species-specific EcoToxChips consisting of 384 environmentally-responsive genes of regulatory concern will be informed, built, tested, and optimized (Activity 3). EcoToxChip performance will be validated (and further optimized) through a 6-laboratory validation study on 22 additional priority chemicals with our end-users and collaborators (Activity 4). Project Phase 2: The approach and knowledge from PHASE 1 will be translated to three native species of Commercial, Recreational, and Aboriginal (CRA) concern representative of Canadian ecosystems (i.e., fish: rainbow trout; bird: double-crested cormorant; amphibian: wood frog). The activity serves as a proof of concept (i.e., EcoToxChips can be ported to other species), but also prioritizes work on three species of great interest to Environment and Climate Change Canada, and Canadians in general. 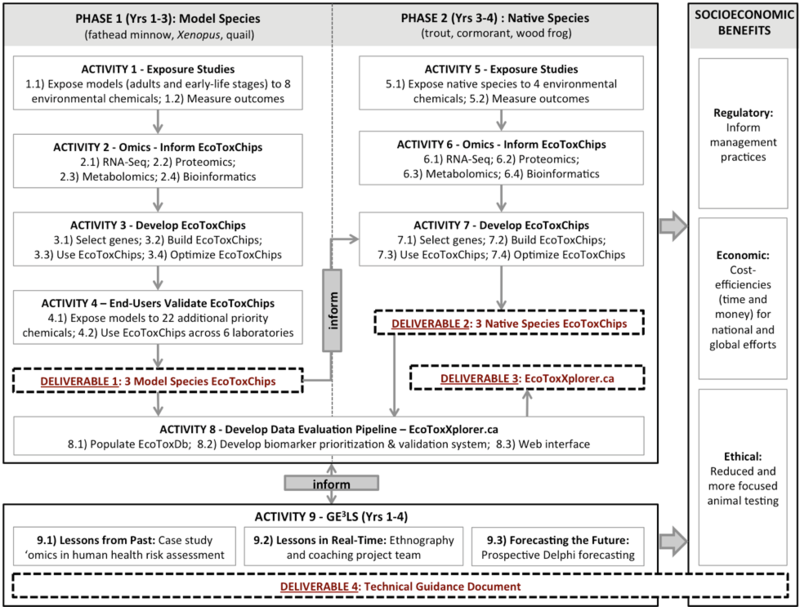 Exposure studies (Activity 5), ‘omics-informed EcoToxChip design (Activity 6), and EcoToxChip development and use (Activity 7) in native species will mirror steps described in PHASE 1 for the model species. = DELIVERABLE 2: EcoToxChips for three native vertebrate species of Commercial, Recreational, and Aboriginal concern (rainbow trout, double-crested cormorant, wood frog) representing key species monitored by Environment and Climate Change Canada. Data Evaluation Tool - EcoToxXplorer.ca: In parallel to, and informed by, Activities 1-7, the research team will develop an intuitive online bioinformatics pipeline (EcoToxXplorer.ca) (Activity 8). The EcoToxXplorer.ca will be a knowledgebase that will consist of toxicity pattern recognition algorithms that are based on key AOPs and other toxicity pathways developed from the extensive data obtained during this and available through other studies (e.g. by linking to our own EcoToxDB, plus international efforts including AOPXplorer, Effectopedia, etc.). It will provide a simplified colour-scheme-based summary assessment of the toxic potential of a chemical that allows, for example, easy categorization and prioritization of a chemical/sample based on type of toxicity (e.g. endocrine disruptor vs. systemic toxicant), severity, and potency. Additional features for advanced users will also be provided. EcoToxXplorer.ca will be modeled after our highly successful, intuitive cloud-based platforms: metaboanalyst.ca and NetworkAnalyst.ca. = DELIVERABLE 3: EcoToxXplorer.ca is an online data evaluation tool that provides functions to allow users to upload EcoToxChip data and interpret results. GE3LS Research: The GE3LS* component of the research is designed to advantageously position the team to help transform the field of ecological and chemical risk assessment through the development and commercialization of EcoToxChips, while producing new social science knowledge about the phenomenon of “institutional entrepreneurship” (Activity 9). The adoption of EcoToxChips into accepted practices of risk assessment and management will be informed by a retrospective qualitative case study of how ‘omics tools became accepted for human health risk assessment; as well as a prospective Delphi study that will draw on survey research and quantitative methods to forecast the future. In addition, the efforts of project team members will be studied in real time using ethnographic methods, with regular feedback and coaching. = DELIVERABLE 4: Technical Guidance Document is informed by our GE3LS research and will be a resource to advise end-users on how to adopt EcoToxChips.